I know many of you consider Labor Day as the last day of summer, but not me. I want to hold on to this season to the very end and strictly go by the calendar. This year Autumn starts on Friday, September 22, 2017, so I am holding on. 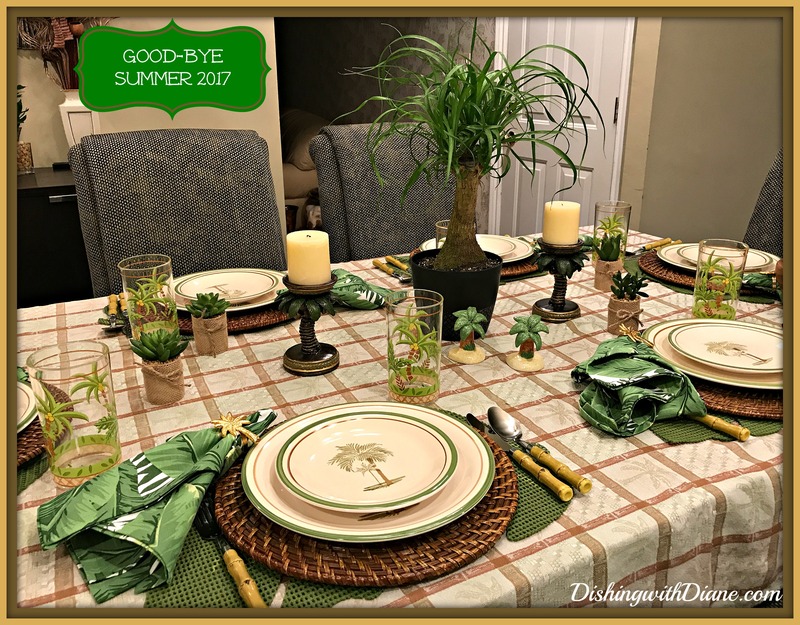 The nights have been getting cooler with a subtle reminder that my favorite season is saying good-bye; so to pay tribute to summer, I decided to post one more summer tablescape. As you all know by now, I just love the beach and it is a big part of the summer season for me. The sand, sound of the waves and the peaceful feeling the beach brings. Maybe because I live on an island but the beach is definitely my happy place. 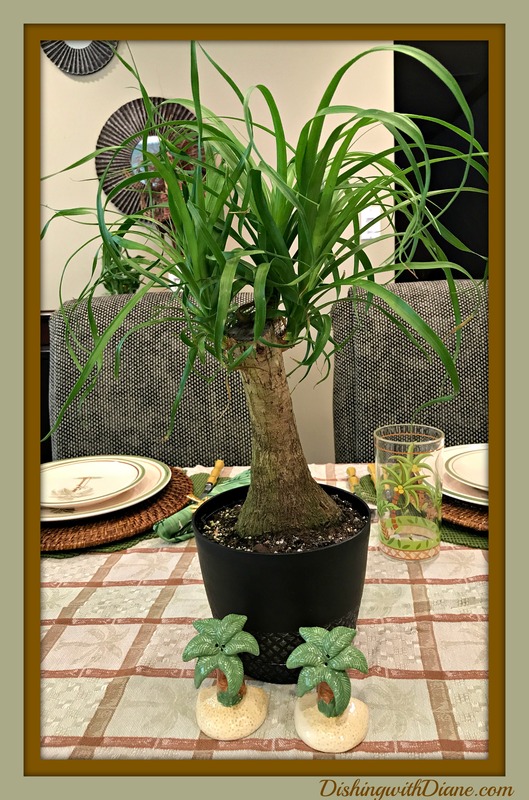 I was trying to think of a theme for this end of summer tablescape, and then I read a newspaper article that some of the local waterfront restaurants here on the island with private beaches, are planting palm trees to enhance the tropical island atmosphere of their restaurants. 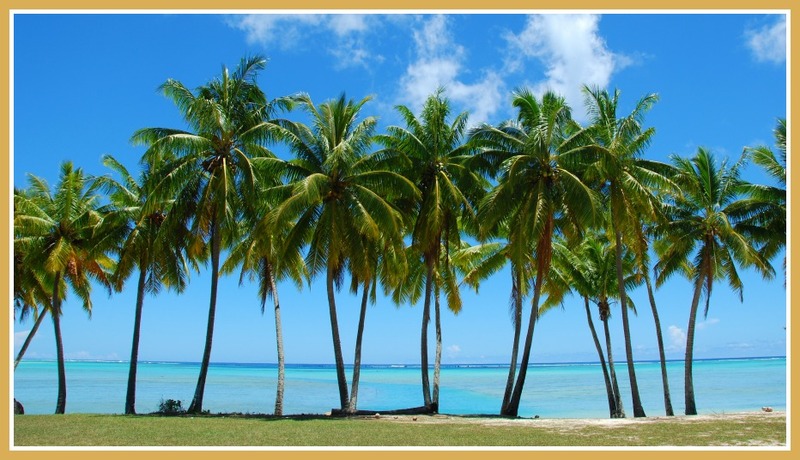 Well, I just found my theme to say good-bye to summer- palm trees. And I have the perfect set of dishes for this theme. 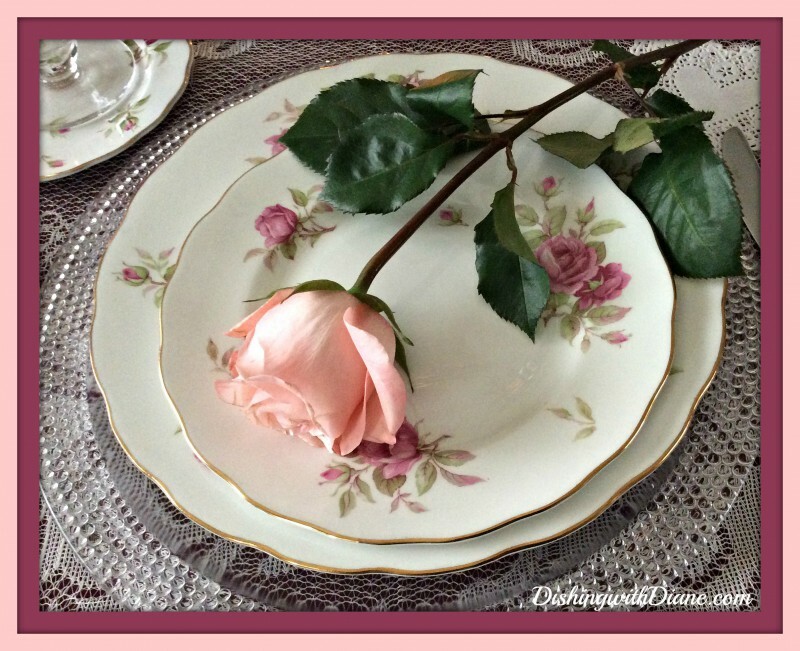 The tablecloth…. 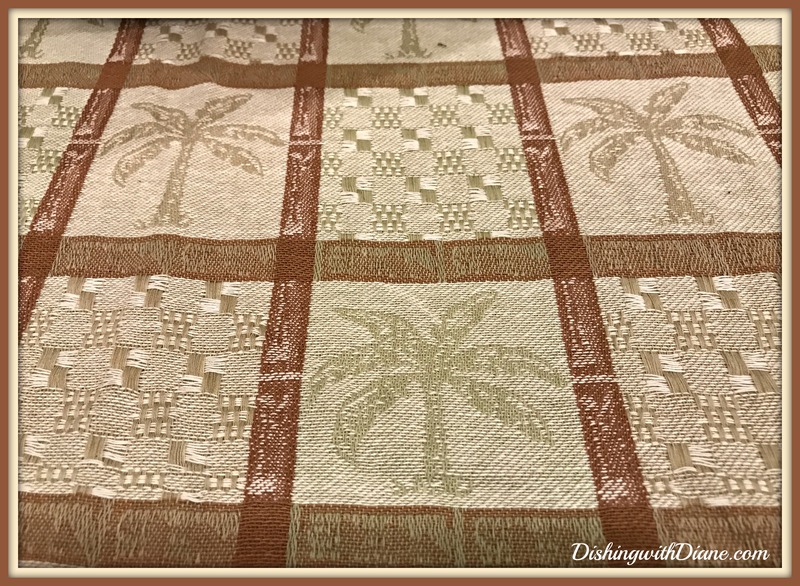 I am using a tan, sage green, cocoa brown and beige tablecloth embossed with palm trees. I like the muted colors because I have candlesticks that blend perfectly with this tablecloth. 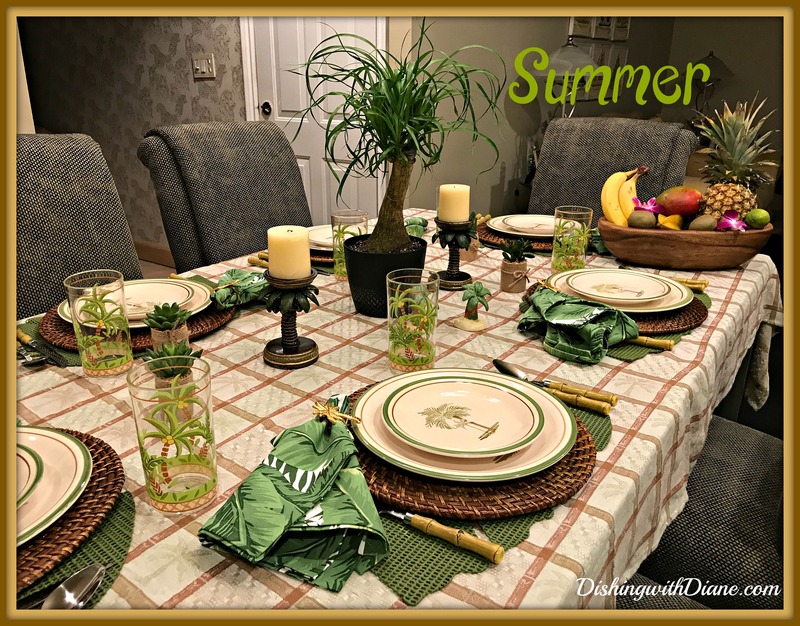 I used outdoor placemats that I bought for the patio table that are made out of PVC covered jute netting. You have probably seen similar placemats, they look like rubber. 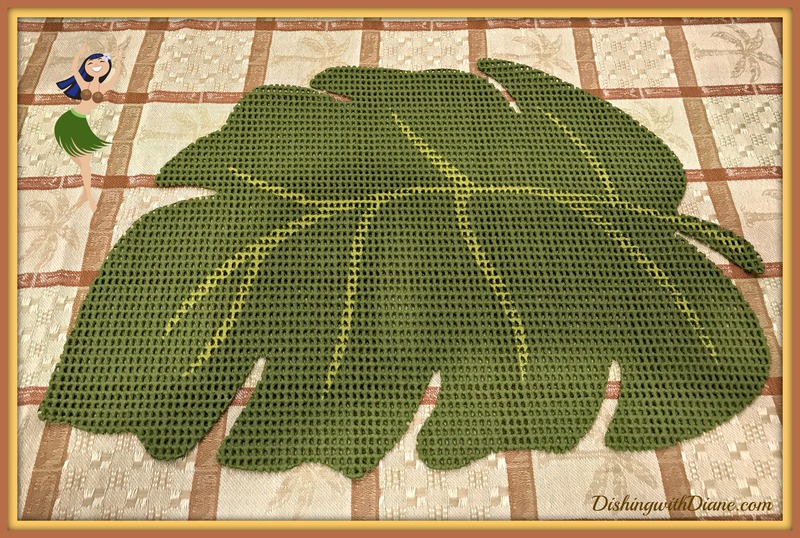 I bought the placemat in the shape of a palm tree frond. 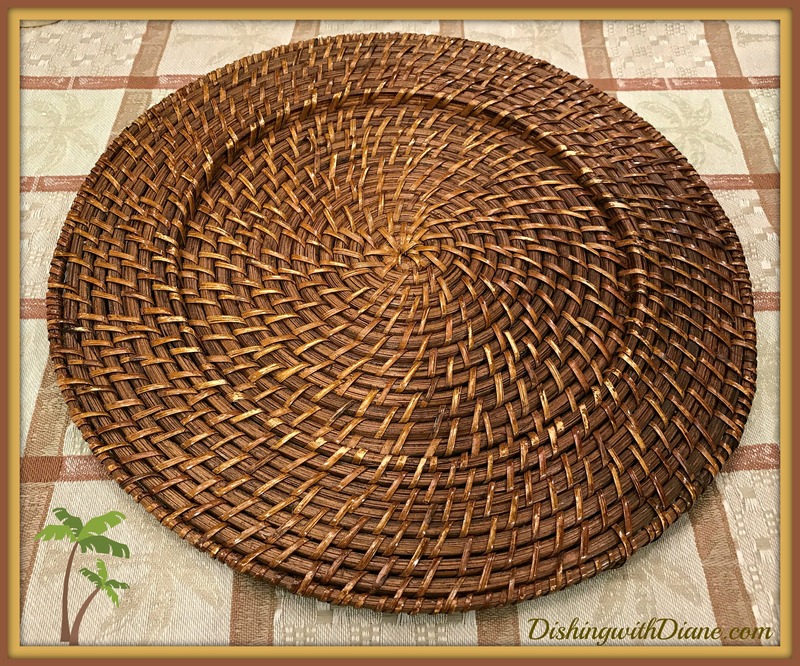 Along with the frond placemat, I am using my a brown rattan chargers once again. I get the most use out of these chargers. 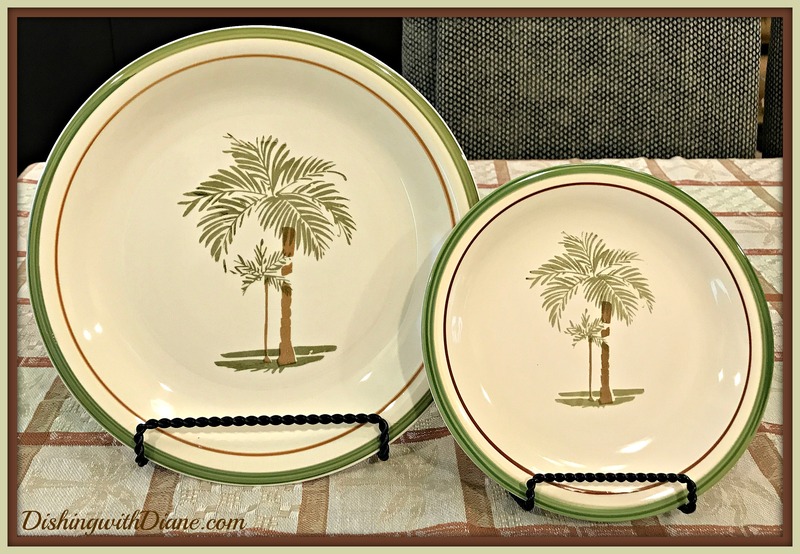 The set of “palm tree” dishes was a birthday gift from a friend a few years back and I only had the opportunity to use them once last summer. So I decided to use them for this post and I hope my friend enjoys seeing her gift on the blog. The dinner plates and salad plates have the same design. 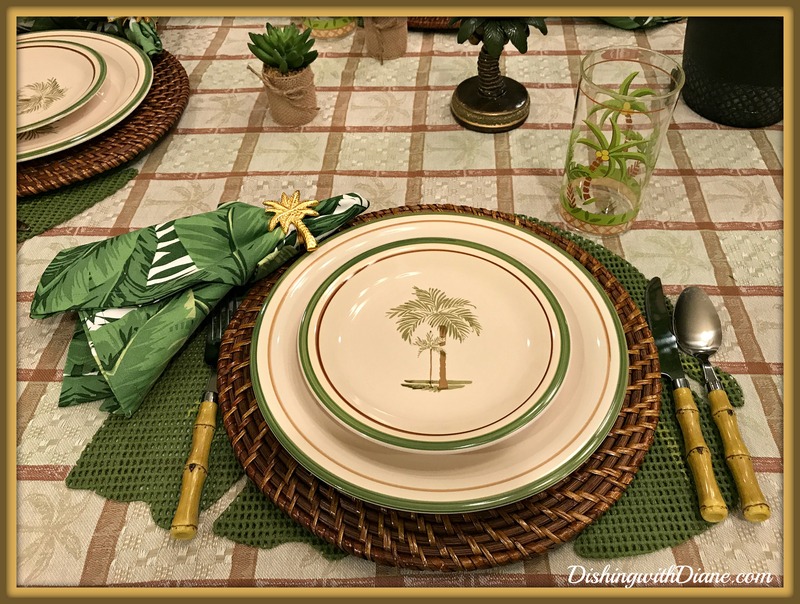 A beige background bordered in sage green and a cocoa brown around the rim with two palm trees in the center, also in sage green and cocoa brown. The complete set comes with dinner plates, salad plates, bowls and mugs. I think the dishes match the tablecloth perfectly. 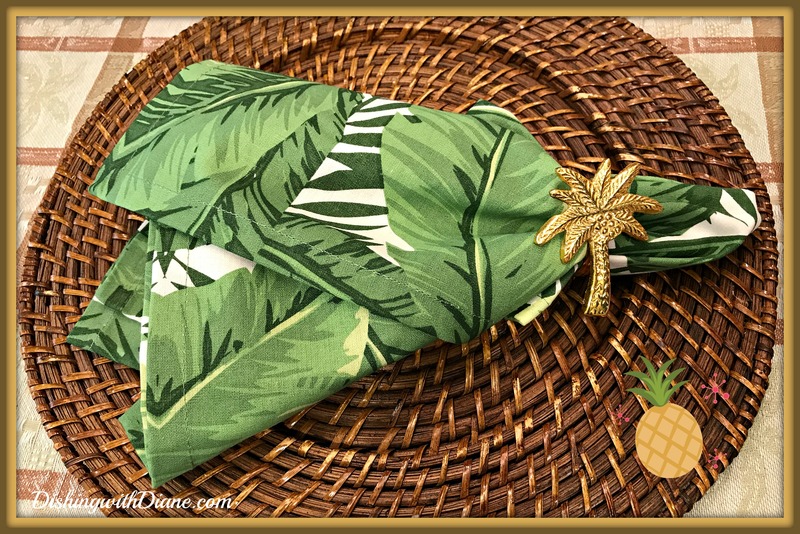 The napkins are 20″ x 20″ over sized cotton napkins with a tropical leaf pattern along with the cutest gold palm tree napkin rings that I picked up from a great store in Florida that specializes in coastal home accents. 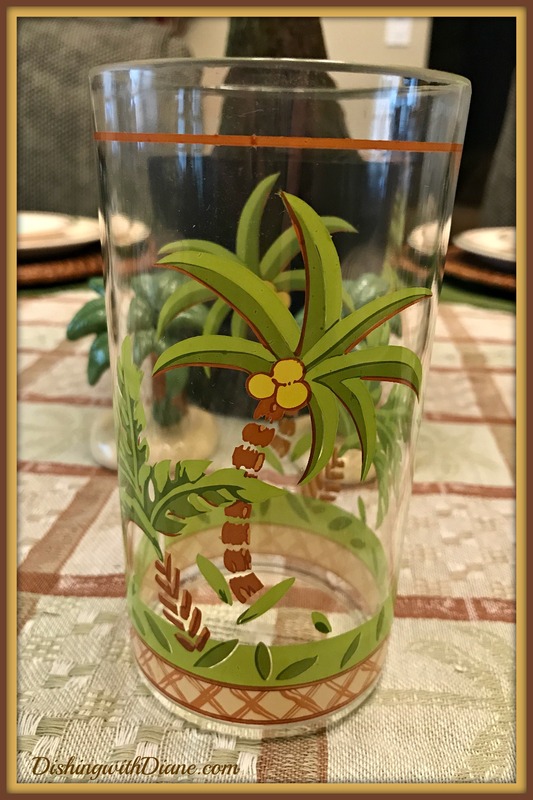 The glassware are acrylic highball glasses featuring sage green and cocoa brown palm trees with a cocoa brown rim on the top of the glass and a cross hatch pattern on the bottom of the glass. 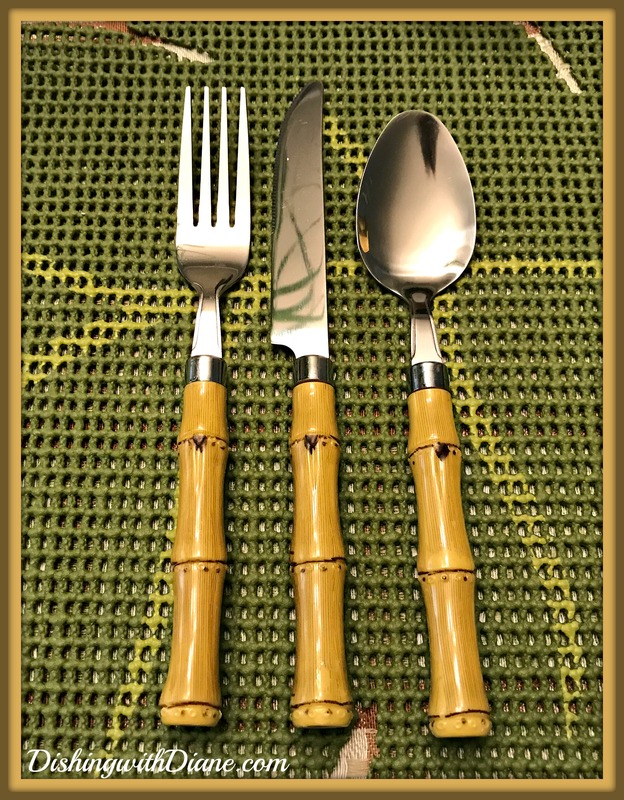 The flatware is bamboo. 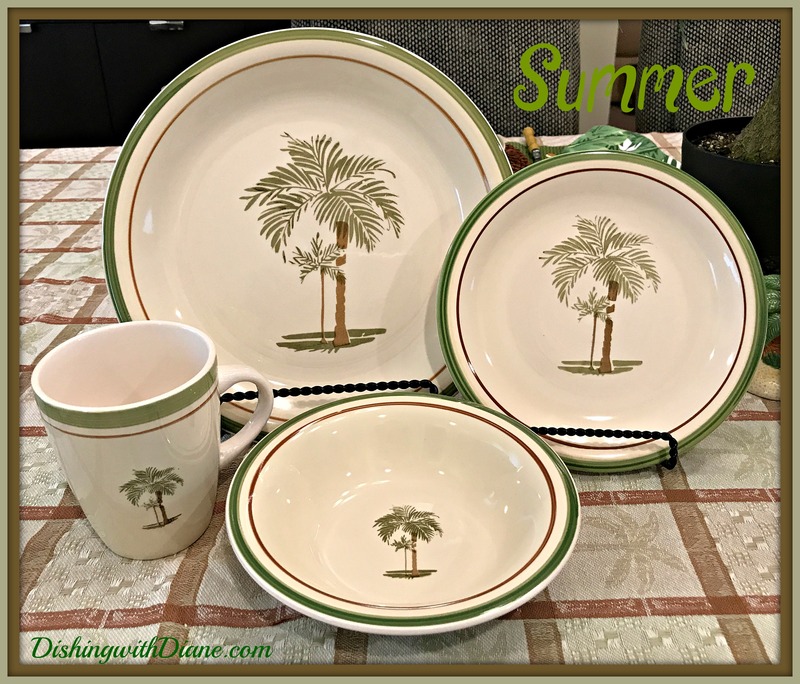 I love using this set for my summer tablescapes. As I mentioned before, I have the perfect candlesticks for this tablescape. 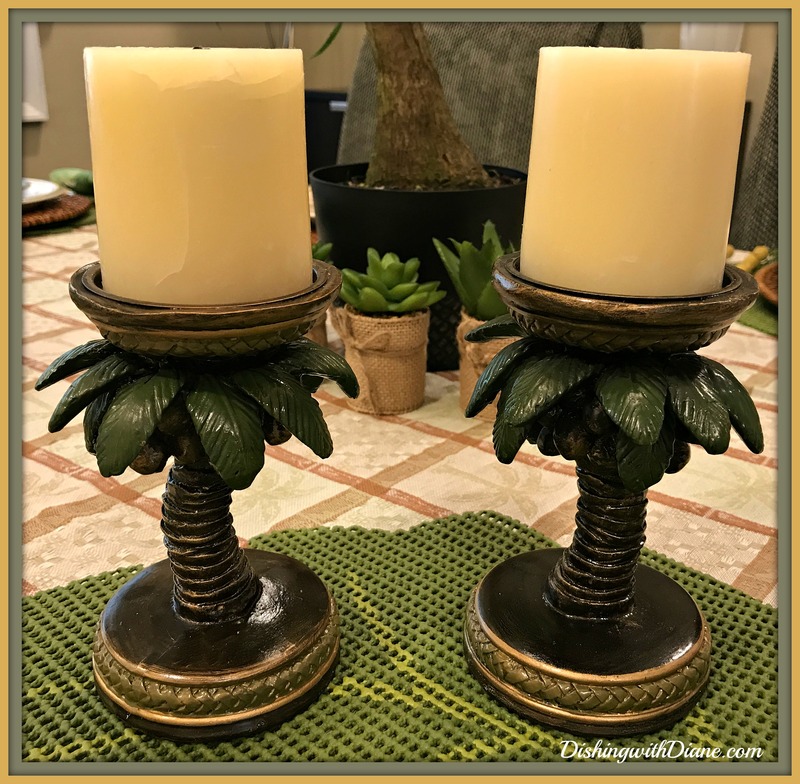 They are polyresin palm trees in shades of olive green and brown along with off white pillar candles. 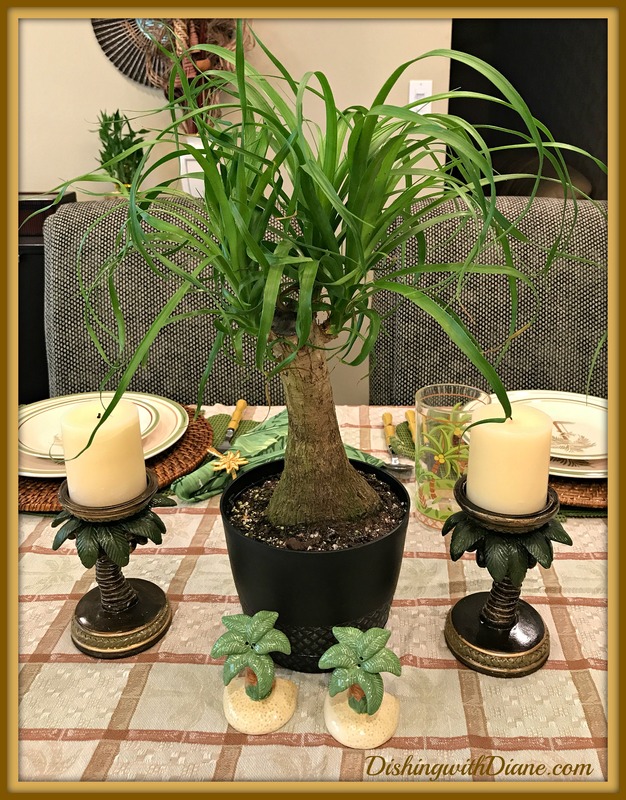 I told Bob that I was planning on a “palm tree” tablescape and my honey went out and bought me a tabletop palm tree. It’s perfect and I love it; and it is the new centerpiece. 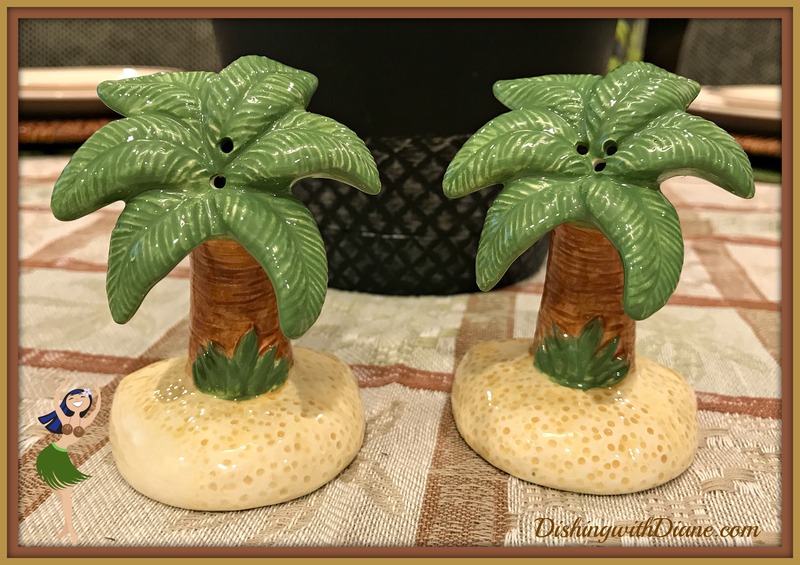 My addiction and love for salt and pepper shakers continues and I found the cutest set of palm tree salt & pepper shakers on Amazon that look like the palm trees on the dishes. 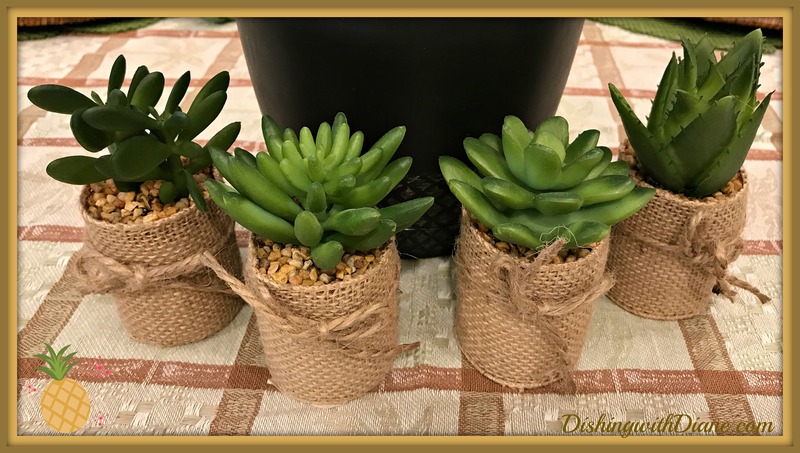 I added an additional table accent, imitation succulents wrapped in burlap. I am sure with my NOT so green thumb, I could kill a real succulent in record breaking time so I am sticking to artificial. 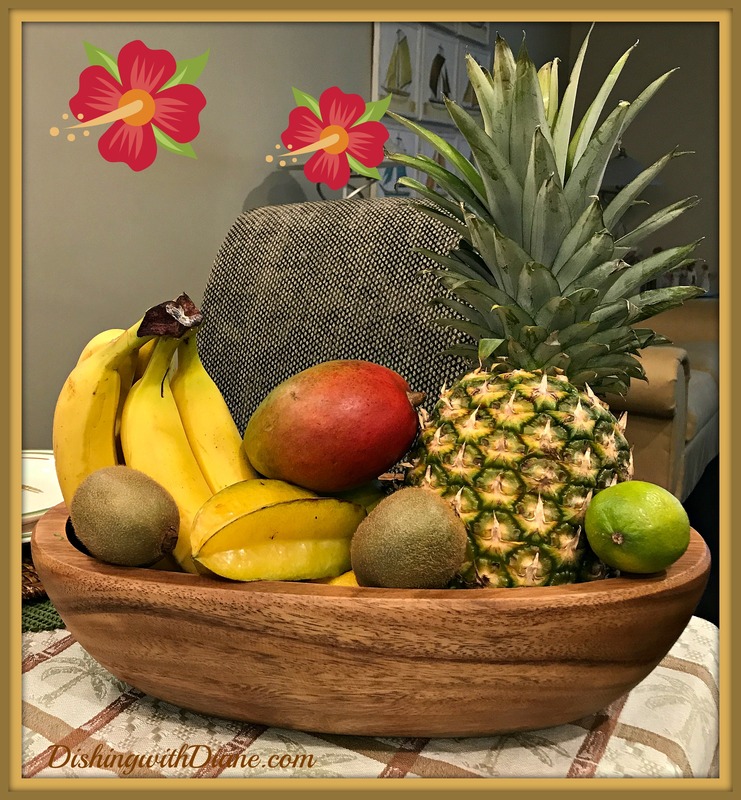 I thought an Acacia wooden bowl filled with tropical fruits such as pineapples, mangoes, kiwi, bananas, and starfruit; would be a nice touch for the table as well. 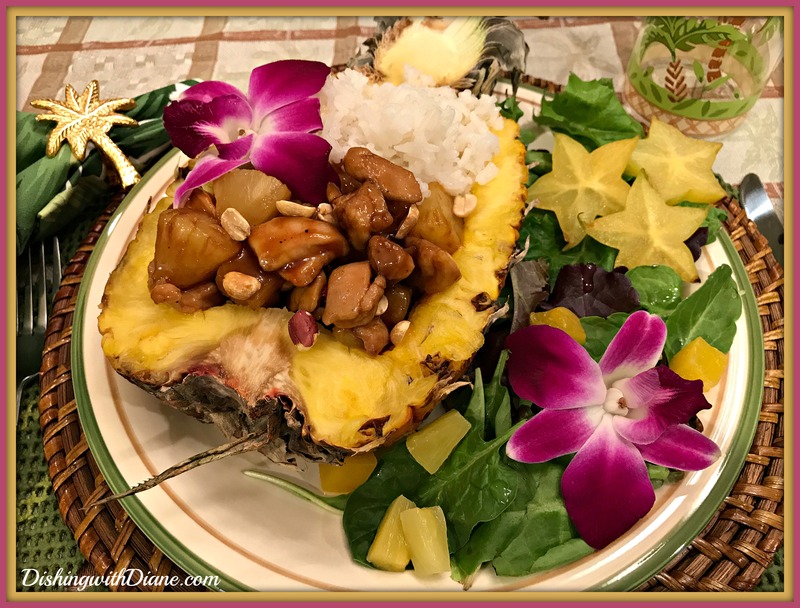 So to say good-bye to summer, I just had to plan a meal to go along with the tropical feel as a send off to my favorite season, so I chose sticky pineapple chicken served in a pineapple boat with coconut rice and a tropical fruit salad. 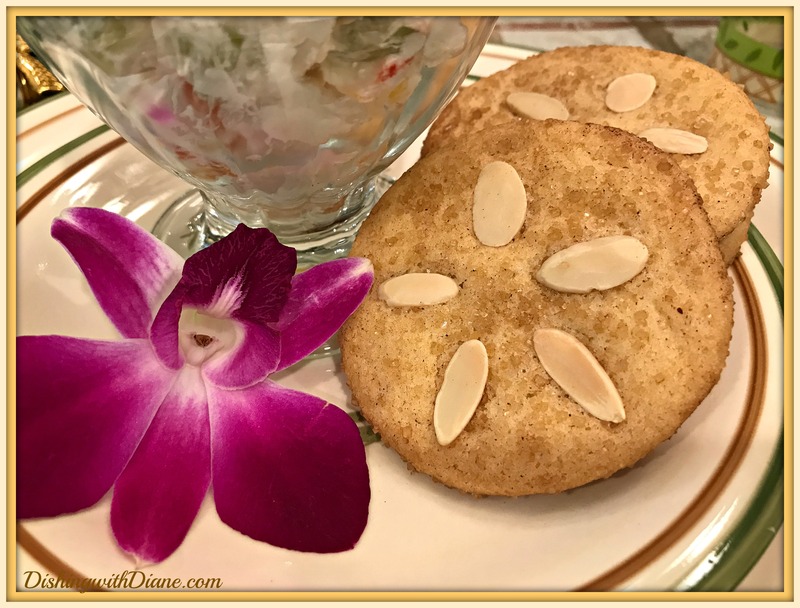 My dessert choice was Ambrosia & cinnamon sugar sand dollar cookies. Well, unfortunately for me, the time has finally come to say good-bye to Summer. See you in 273 days when Summer starts again on June 21, 2018. I am starting to count down already. Wouldn’t you know, the rest of this week we are supposed to have weather like a hot Summer day. Temperature in the 80’s. Thank you Summer for one last hurrah! Now I feel a little better. 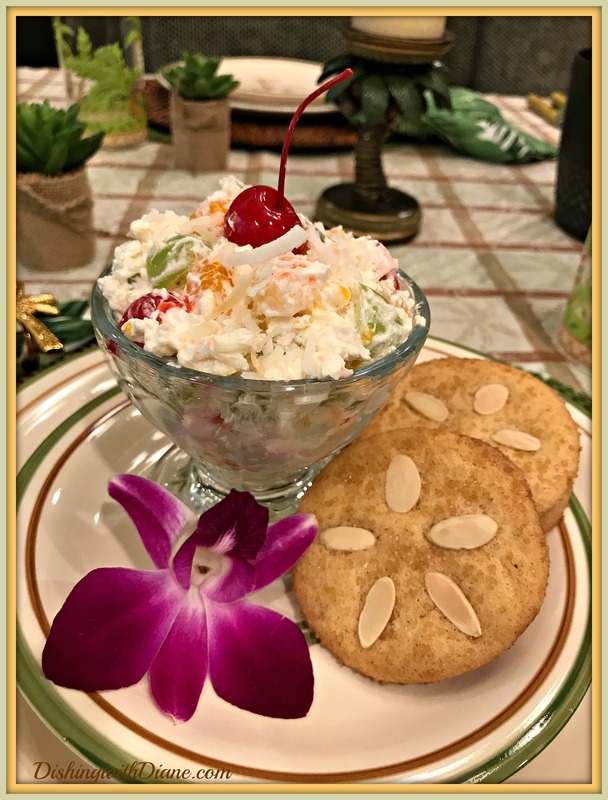 I hope you try some of the recipes on today’s blog and enjoy. In a medium saucepan, whisk together the pineapple juice, soy sauce, chicken stock, hoisin sauce, brown sugar, garlic and cornstarch. Bring the mixture to a boil and cook until the mixture has reduced to about 1 cup and is the consistency of thick syrup. Set the sauce aside. Add the olive oil to a large nonstick skillet set over medium-high heat. Add the chicken to the pan and season it with salt and pepper. Cook the chicken, stirring, until it is no longer pink, about 5 minutes. Drain off any liquids then add the sauce to the pan and stir until combined. 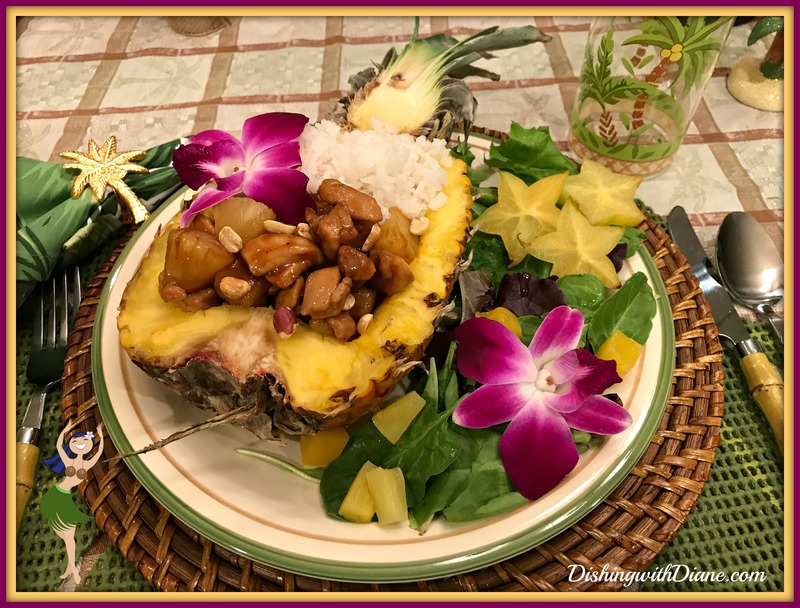 Add the pineapple and cashews and cook, stirring, for an additional 1 minute. COOKS NOTE: You can make this dessert look more festive if you can find the multi-colored mini marshmallows. In a medium bowl, whisk together the flour, salt, baking powder, baking soda, and cream of tartar. With the mixer running on low speed, slowly add the dry ingredients to the wet ingredients in 3 different parts. The dough is quite thick and you may have to stir the rest by hand. Scoop a large section of dough (about 1 Tablespoon of dough each) and roll into balls. Make sure the balls are taller, rather than wide. Make the topping: Mix the sugar and cinnamon together in a small bowl. Roll each dough ball into the cinnamon sugar. Press 5 sliced almonds onto the tops of each dough ball, as pictured above. Chill the balls of dough for at least 2 hours and up to 48 hours in the refrigerator. This step will prevent spreading in the oven. Preheat oven to 350°F. Line 2 large baking sheets with parchment paper or silicone baking mats. (Always recommended for cookies.) Arrange cookies 3 inches apart on baking sheets. Bake chilled cookie dough for 10 minutes. The cookies will appear undone and very soft. Allow the cookies to cool on the baking sheets for 3 minutes and move to wire rack to cool completely. Cookies stay soft & fresh for up to 1 week at room temperature. Cookies freeze well. Cookies may be rolled into balls and frozen up to 3 months to bake at a later date. Recipe can easily be doubled or tripled. 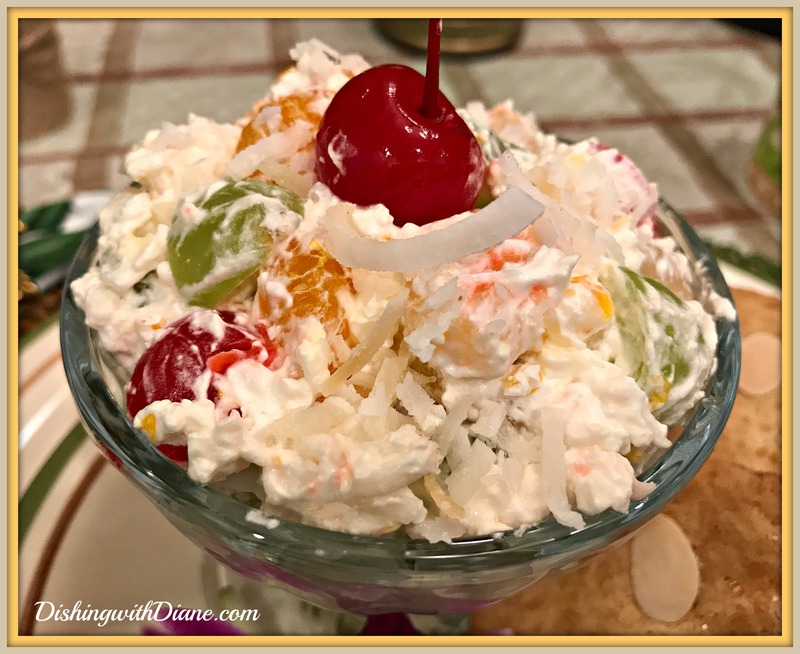 This entry was posted in All Occasion Tablescapes, Chicken, Desserts, Rice on September 21, 2017 by aries041158.